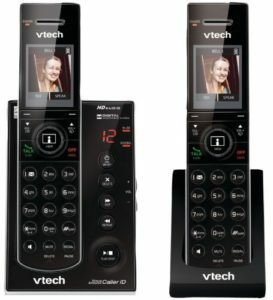 Looking for a new wi-fi video doorbell? How about “going under the radar” and looking at devices that are less well known? 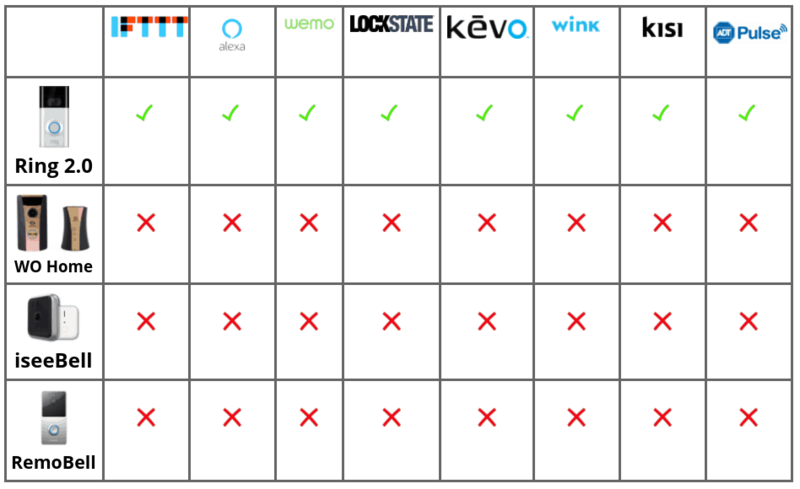 In this post, I compare an established brand of smart doorbell against some less well known models. Please use the headings below to move between the different sections of this review. 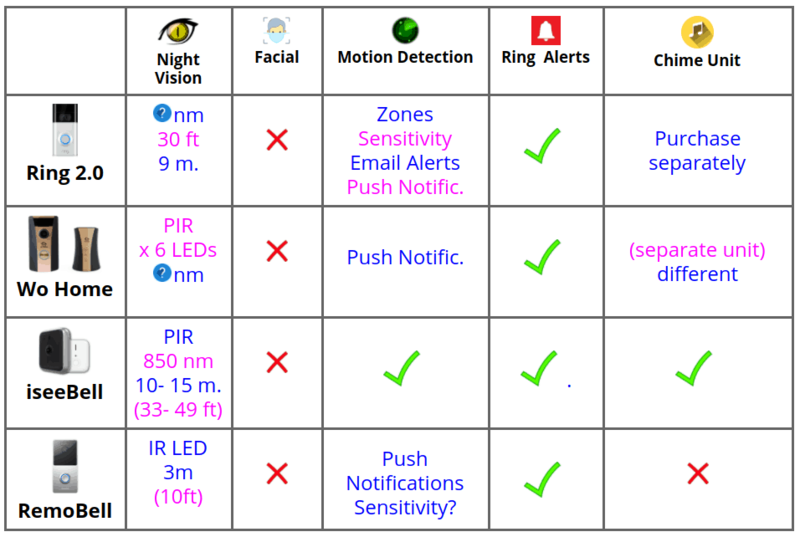 This chart displays the most important features of these smart doorbells. In this first chart, I outline the most important differences between all these doorbells. The first major difference between these doorbells is in the resolution that they shoot video footage in. The ring 2 doorbell shoots footage in 1080p whereas the other three doorbells record video footage in 720p. 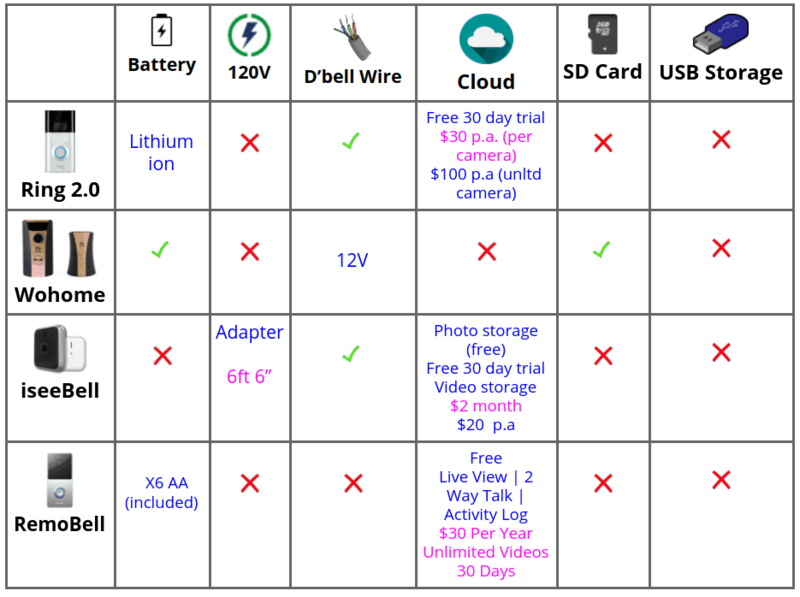 The Ring 2.0, iseeBell and Remobell doorbells all use cloud storage, whereas the WO Home doorbell Warehouse the uses SD cards as a form of storage. The iseeBell has a field of vision of 185°. The Ring 2.0 has a field of vision of 160°. The WO Home and Remobell both have fields of vision of 120°. The Ring doorbell is the only doorbell in this comparison that is compatible with any home automation systems. The Ring, WO Home and the iseeBell door bells all are powered primarily from low voltage doorbell wire. The iseeBell can also be powered with a 120 volt adaptor. The Remobell is powered via rechargeable batteries. In this section I compare some of the basic features of these wifi video doorbells. So looking at all the manufacturers, each of these doorbells is made by a different company. Ring are possibly the most well-known company and most of their products have been smart video doorbells until last year when they launched a security camera. WO Home home is the smart home division of a huge Chinese mobile company, China Unicom. China Unicom is actually the fourth largest mobile company in the world. iseeBell is a company that at the moment only makes Wi-Fi video doorbells. It is based in Massachusetts and was founded in 1999. RemoBell is made by a company called Olive and Dove. They were founded in 2014 and they make a range of smart home products, including security cameras. I think that all of these doorbells are of a similar weight. The two heaviest doorbells are doorbells that come with chime units. This is perhaps why they are heaviest. The WO Home doorbell is noticeably bigger then the other doorbells here. The Ring 2 doorbell is the smallest. When I was putting this video together, the Ring 2 doorbell was the most expensive and it costs $199. In this section I compare some of the smart video features of these doorbells- such as night vision. In this section I compare some of the smart video features that these devices have. All of these gadgets have night vision. The Ring 2 doorbell has a night vision distance of about 30 feet or 9 metres. The iseeBell has a distance of about 10 to 15 m.
None of these devices use facial recognition technology. All of these doorbells have motion detection. The ring 2 doorbell has the most sophisticated motion detection capabilities. It will allow you to set up zones within the field of vision in which to monitor motion detection. You can then adjust the sensitivity settings in the zones. When motion has been detected you can either get an email or a push notification. All of the other three doorbells have motion detection but I could not find much information about their exact capabilities. When motion is detected they will send you push notifications and I think the RemoBell includes the ability to adjust sensitivity settings. 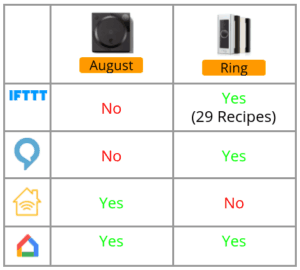 The four door bells in this comparison all have ring alerts. When someone presses the doorbell the app will let you know. Two of these doorbells come with chime units. Chime units are the speaker units that you install inside your house and when the doorbell is rung, they will play a tune. Chime units come with the WO Home doorbell and the iseeBell. With the Ring 2 doorbell you can purchase a chime unit separately. 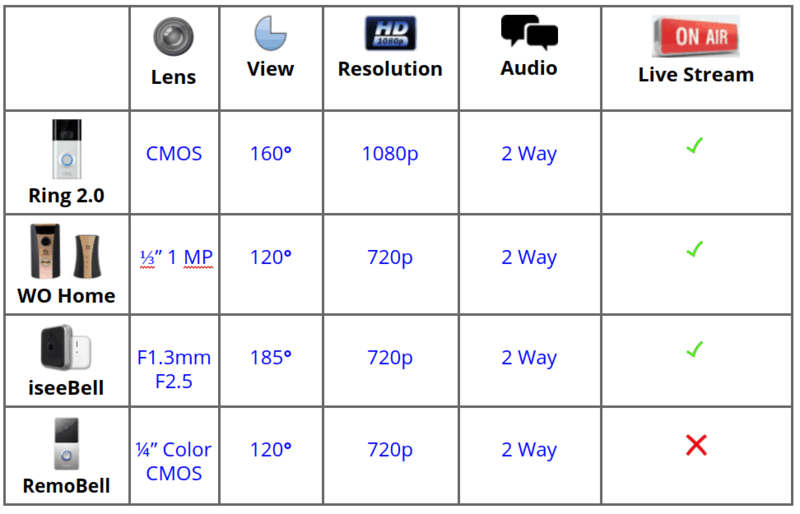 In this section I compare some of the basic video and audio features of these devices. The iseeBell has the best field of view of all of the door bells in this comparison with a whopping 185 °. The Ring 2 comes in next with a field of view of 160 °. The WO Home and the Remobell each have a field of view of 120 °. Only the Ring 2 doorbell records footage in 1080p. All the other three doorbells record video footage in 720p. 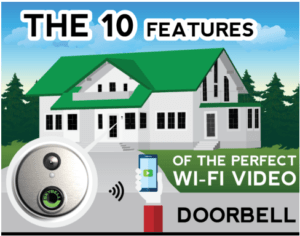 Only the very top Wi-Fi video doorbells shoot video in 1080p. All 4 of these doorbells have 2 way audio. This will allow you to connect to your doorbell via the app and have a conversation with whoever is at your front door. Three of these doorbells offer the Livestream or live view facility. This allows a user to connect to the doorbell at any moment and see what is happening live. The RemoBell doesn’t allow you to do this, because it is operated by batteries. And doorbells which are operated by batteries don’t tend to offer live view because it just uses up so much power. In section six, I will look at the power and storage features. I think that the different power needs of these devices are quite difficult to get your head around. Three of these doorbells are powered by low voltage doorbell wire. These are the Ring 2, the WO Home and the iseeBell. The iseeBell can also be powered by using 120 volt adaptor, if you don’t have any existing doorbell wire or you don’t want to install any. The RemoBell is powered by 6 double A batteries. Moving on to storage, the only way that footage can be stored for three of these doorbells is by using a cloud storage system. Cloud storage systems are used by the Ring 2, the iseeBell and the RemoBell. The Ring 2 has three different plans. Ihas a free 30 day trial and then it has two levels of paid plans. A basic plan will cost $30 per year per camera. The protect plan will cost $100 per year for unlimited cameras. The cloud storage for iseeBell will allow you to store unlimited photos for free. It then has a 30 day free trial and when that ends you can sign up for a $20 per year video storage plan. Finally the cloud storage plan for the RemoBell also offers a free 30 day trial. After that, Remobell offer one paid plan. This will cost you $30 per year which will give you unlimited video storage for 30 days at a time. Only the WO Home doorbell allows you to store your videos on an SD card. None of the doorbells makes use of USB storage. In section 7, I will compare the different sorts of connections that these doorbells use. In the first part of the connection section, let’s have a look at the number of users or more precisely the number of different phones that can connect to each of these products. The Ring 2 And the iseeBell allow an unlimited number of devices to connect to them. the WO Home allows four devices to connect to it and the Remobell allows 5 devices to connect to it. None of these devices use Ethernet to connect to other devices or other networks. None of these devices use Bluetooth to connect to other devices or other networks. Thinking back to cloud storage, the strength of encryption that a cloud storage system uses is very important. The Ring 2 cloud storage uses 128 bit encryption which is a very secure standard and is used by most Banks. However, the RemoBell uses an even more impressive level of encryption- 256 bit. Section 8 is all about features that relate to design, installation and warranty. The colors are Venetian Bronze and Satin Nickel. All of the other doorbells just come in one choice of colour. The WO Home comes in one choice which is black and gold. The iseeBell’s colour scheme is black and silver as is the RemoBells. All of these devices are described as weather resistant which is totally appropriate because they should all be placed outside. What is a little strange is that only one of them has an official IP rating. IP stands for Ingress Protection and it is an industry wide rating that shows how protected a product, designed to be used outside, is against the elements. The iseeBell has an IP rating of 56, which means that it is totally protected from any dust and that it will continue to work in a light rain storm or snow storm. It is not totally waterproof and will not continue to work if it gets soaked in a heavy rain storm! All of these gadgets operate in very similar temperature ranges. iseeBell operating temperatures are from -25 to 50 °C which is -4 to 122 °F. The three other doorbells don’t quite have a temperature range as wide as that but they are very similar. Looking at the installation requirements for these products, they can all be installed by people with a basic grasp of DIY. The Ring 2 has developed high quality video tutorials to help you at every step along the way. iseeBell has also created a set of video tutorials. I cannot find any installation videos for the RemoBell but there are good written instructions. The WO Home doorbell also provides written instructions for installation. Unofficially there will be installation videos for each of these doorbells on YouTube. These would not have been created by the companies but just from people who have bought the doorbell. The Ring 2 and the RemoBell have the same warranties. They offer a basic 1 year limited warranty with free lifetime replacement for any doorbells which are stolen. In order to qualify for this you must produce a police report detailing the theft. I could not find any specific details about the warranty for the WO Home doorbell. In this section I will compare how compatible these doorbells are with different home automation systems. In this section we’re going to be looking at the different smart Home systems that these devices are compatible with. 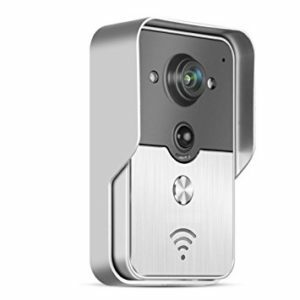 There are numerous systems and languages that different smart devices use and in reality Wi-Fi video doorbells tend to be a bit limited in their home automation compatibilities because they tend just to be compatible with smart locks and Alexa- Amazon’s system. The Ring 2 doorbell is the only doorbell in this comparison that is compatible with any other smart Home system. and the ADT Pulse Security System. Section 10 is all about different aspects of “remote access”. And section 11, we take a careful look at the different thoughts that buyers have about these products.